The Merrow Sewing Machine Company, based in Fall River, Massachusetts recently launched a new Merino wool clothing company called WoolPRO. They knit and sew everything themselves, and spent several years developing the fabrics for their products. They introduced a new stitch called Activeseam into the textiles market, and created the first branded stitch. Diversifying into wool production with this Activeseam stitch in 2012, and building a knitting and sewing facility to support the development and production of their new products, over the past three years Merrow WoolPRO developed several weights of 100% Merino wool, as light as 135g. and as heavy as 250g. The fabrics they manufacture are not sold to other brands. They use them entirely for their WoolPRO line. The products they make are traditional base layer, and for 2016 a variety of midlayer products, including two styles of 250g hoodies, some tremendous socks, and a 195g. full zip top. Included in the Cool Knit Merino 135g line is The Juno, a versatile ultalight short sleeve knit that allows you to go full tilt on the trail without over heating. Disclosure: I was contacted by the President of Merrow to try any one of several styles of their WoolPRO product line. With hot summer weather fast approaching, The Juno is the one I chose. I could wear it as a base layer on still cool spring mornings, and by itself as the afternoon warmed. It was provided at no cost to me. My only responsibility was an agreement to complete this review after trying the item. I was not pressured in any way to make a positive endorsement. The Juno is a member of the ultralight 135g Cool Knit Merino family of products from WoolPRO. Cool Knit is 100% merino wool, which makes it 100% anti-bacterial, words thru hikers love to here since changing clothes on the trail is a rare occurrence. Because of its light weight, Cool Knit merino disperses moisture across a wider area allowing it to evaporate faster… the wicking principle that is a must in outdoors garments today. The superfine knit also means that you’ll be cool when it’s warm, and warm when it’s cool. WoolPRO performance tops are made with the finest Australian merino and sewn with Merrow ActiveSeam technology. My experience with ActiveSeam revealed it to be tough stitch unlikely to unravel even after long term use and multiple trips to the washing machine. The stitching is flat so it doesn’t rub in the wrong places. ActiveSeam is branded and identifiable in retail stores and comes in a nearly infinite number of variations. The V-Neck collar enables air flow for hot weather. No shoulder seam provides additional comfort when carrying a pack and side seams are replaced with side panels to eliminate chafing. The Juno is an athletic fit short sleeve tee. That means it is form fitting. If you are young and athletic with 6-pack abs, you will like the way it makes your flat stomach look. If you are a sixty-something like me who has succumbed to the inevitability of gravity no matter how hard you try, the tight form fit will advertise your love handles. You may want to go up a size. There is reasoning behind the close fit though. The shirt rests next to the skin and maximizes Cool Knit Merino’s temperature and moisture management properties. Wicking works better with a tight fit. The drop tail design means that if you like a tucked shirt, it will stay tucked in the back, even when you bend over. No worries about revealing plumber’s crack to your hiking compadres. Merino wool generally has a tendency to shrink in the laundry, so I tested The Juno to see. I was careful to use a cold water wash and light tumble dry, and good news! It retained the initial sizing. Also, right out of the box, The Juno was just a little bit itchy, not much, but it was noticeable. Again, not uncommon for wool, even merino. After that first washing, all gone… no more itch. So wash it before you wear it and you won’t even know. Immediately upon pulling The Juno over my head I knew it was different. Despite the tiny bit of initial itchiness, this shirt was very comfortable. It is stretchy because of its light weight. It is airy and breathable because of that light weight. Even though a size large might have been best for me, the medium that I requested also fit comfortably. I tested The Juno hiking in the high country of Western North Carolina on one of those cool morning, warm afternoon early spring days. I started with The Juno as my base layer with a long sleeve merino crew over top. Even after more than an hour of up and down hill, The Juno was completely dry. This is one of the best wicking merino tees I’ve ever worn. After lunch as the temperature rose into the mid-sixties I removed my top layer and wore The Juno by itself for the return trip. Once again, not a drop of perspiration clung to the material. Amazing! Spring in the mountains means wildflowers, so I was up and down off the ground dozens of times taking macro photos. I never once had to worry about readjusting the shirt when I got back up. The tail stayed tucked and the sleeves didn’t ride up my shoulders. The fit remained comfortable throughout. 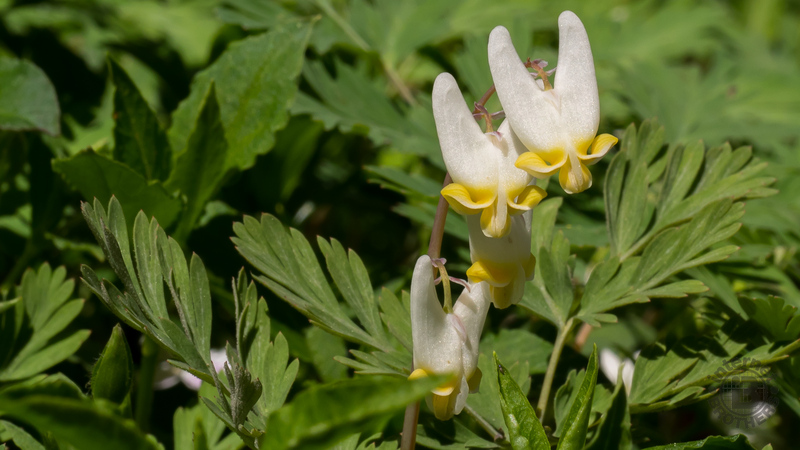 The aptly named dutchman’s breeches is one of those exotic wildflowers found in the Blue Ridge Mountains. I may have a new favorite shirt. The Juno is that comfortable. The Juno Cool Knit Merino tee by Merrow comes in black and aquamarine and sizes S, M, L, & XL for men. There is also a ladies cut with the same colors and sizes. The Juno has a MSRP of US$59.99 and is purchased directly from WoolPRO, who also have a complete line of different weighted base layer merino wool products. WoolPRO has been extremely generous, offering a 20% discount on all their products to Meanderthals readers. I highly recommend the WoolPRO Juno Cool Knit Merino base layer t-shirt. It is extremely comfortable and built to last. I can see myself wearing this shirt over and over throughout the summer. The folks at Merrow have a great product and their direct to customer marketing model removes any middle-man hassles. Merrow has been in the sewing machine business since the 19th century. They know their stitching. They knit their own merino wool into multiple layered weights, use their own branded stitching, and sell directly to you from WoolPRO. That’s called keeping it in house.